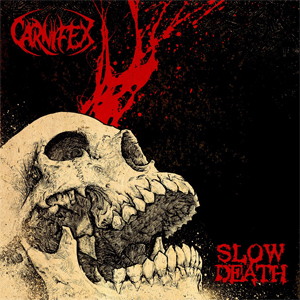 CA based metal outfit CARNIFEX will release their new album entitled Slow Death on August 5 via Nuclear Blast Records. The record was produced and recorded by CARNIFEX and Mick Kenney (ANAAL NATHRAKH, BLEEDING THROUGH), and co-produced by Jason Suecof (DEATH ANGEL, CHELSEA GRIN, JOB FOR A COWBOY). Slow Death was mixed by Mark Lewis (THE BLACK DAHLIA MURDER, WHITECHAPEL, DEVILDRIVER, DEICIDE) at Audiohammer Studios in Sanford, Florida. Cover art for the album was created by renowned artist and longtime collaborator, Godmachine. Check out a quick teaser of music and the album artwork below. "Album number six, over 10 years as a band and we have more fire and passion than ever," comments vocalist Scott Ian Lewis. "This album will reshape our genre and be looked back on as an album that started a new movement for aggressive, dark metal. We're going to show those who love us and those who hate us just how far reaching our ambition is." "Six Feet Closer To Hell"
"Life Fades To A Funeral"
"Countess Of The Crescent Moon"